Understand why nuclear fission leads to the release of energy. Understand the conditions for a chain reaction. Understand the role of moderator and control rods. Understand why nuclear waste is radioactive. How does this curve show us that if a nucleus of about 200 nucleons splits into two nuclei with 100 nucleons each energy will be released? 235U is an isotope of Uranium that will not split spontaneously. 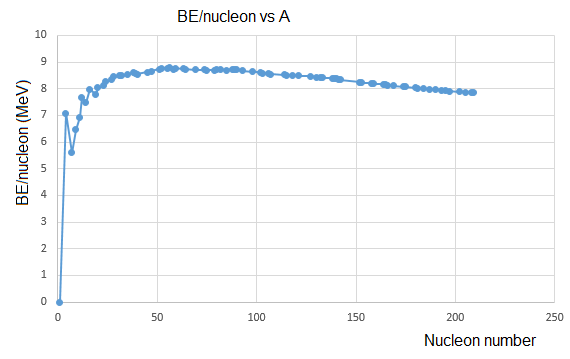 If a neutron is absorbed the BE is increased. When 235U absorbs a neutron it becomes Uranium , this has a binding energy so energy must be . This enables the two halfs of the nucleus to move apart. When this happens a large amount of is released because the binding energy of the is much more than the . This energy goes to the of the . A wood fire only has to be lit once. Every time wood is added the heat from the fire already there makes it burn. The same sort of thing can be achieved with the fission reaction, this is because the products of fission have too many neutrons so when 236U splits up neutrons are also released e.g. Fire a neutron into the 235U and observe what happens. Note that a neutron gun isn't used in a nuclear reactor, instead a neutron source such as californium 253 is used. Naturally occurring uranium contains less that 1% 235U, the rest is other isotopes such as 238U. To simulate uranium ore add 1 235U nucleus and 99 238U nuclei, does a chain reaction occur now? What % 235U is needed to give a chain reaction? In reality the % 235U is about 3% so before it can be used the fuel must be enriched. Add 5 235U nuclei (make sure one is in front of the gun, if it isn't then slide the slider back to 0 and try again. Do you get a chain reaction this time? Try several times to see if you can get it to happen. Experiment to find how many nuclei you need for a complete reaction. The minimum amount of material required for a chain reaction is called the critical mass. If the neutrons travel too fast they will pass right through the 235U nuclei. To be absorbed the neutrons should have a KE of about 1 eV. Approximately how much energy will a neutron emitted from a fission reaction have? To slow down the neutrons they can be collided with other nuclei. In which of the following collisions will the neutron lose the most energy? To slow the neutrons a material is added into the reactor in between the fuel rods, this material is called a moderator. Why are heavy water and graphite commonly used as moderators? Where does the neutron energy go? The ideal situation for a nuclear reactor is to achieve a reaction that continues at a steady rate. If the reaction goes to fast some of the neutrons need to be absorbed by something that doesn't undergo fission such as boron. 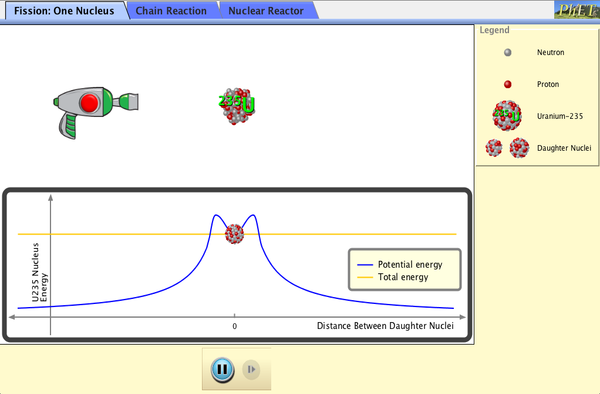 Open the "nuclear reactor" tab in the simulation and observe the effect of moving the control rods in and out. The KE of the fission products is transferred to the surrounding atoms increasing the temperature of the reactor. This enables heat to be transferred to a liquid or gas coolant that is pumped around the reactor. The rest is the same as a fossil fuel power station. If something goes wrong and the control rods can not be moved the reaction can not be slowed down and the recator gets too hot and starts to melt. Once this happens the reactor can not be shut down. Find out what happened at Chernobyl and Fukushima. The spent fuel contains the fission products which are very radioactive and have to be transported and stored with care. Why are fission fragments so unstable? Let's consider 236U. How many more neutrons than protons does the nucleus have? Why is it favorable for large nuclei to have more neutrons? Is this true for small nuclei? If 236U splits into two equal parts, how many more neutrons than protons will they have? Why would these nuclei decay by emitting beta radiation?